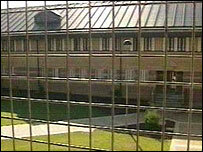 A prison in Kent has been criticised for overcrowding, in a report by its independent monitoring board. The board at Elmley Prison on the Isle Sheppey also raised concerns about staff shortages which means prisoners have less time out of their cells. However, the board did conclude that overall the prison was well run. Peter Hagger, chairman of the Elmley monitoring board, said the problem with overcrowding had been on-going for nearly 10 years at the prison. He said: "There was a new block built about nine years ago designed for single cell use and apart from the first three months they have always been used as double cells. "It means prisoners are eating and sleeping and associating in a cell designed for one with two of them in it. "Another major problem with overcrowding is the prisoners are being located hundreds of miles from their home and the staff at the prison are then expected to help them resettle. "How can you help the prisoner find a job and somewhere to live when the prison is hundreds of miles from where he is going back to?" A report by the HM Inspectorate of Prisons last year praised Elmley for making improvements, despite it holding 30% more inmates than it was built for.